S.Berinsky. Partita "Also sprach Zarathustra"
Video demo: E.Podgaits. Fantasia in memory of Alfred Schnittke. For Bayan (Accordion). Op. 146. 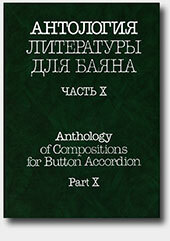 The tenth and last part of our Anthology of Compositions for Button Accordion (Bayan) consists of original bayan pieces composed at the close of the 20th century. The Anthology, whose first volume appeared in 1984, was prepared by the Muzyka publishing house in collaboration with the chair of folk musical instruments of the Gnesins Academy of Music, Moscow. Its ten volumes contain the best of the bayan music written by the composers of the former USSR in the 20th century, beginning with the '30s, when the first pieces by professional composers appeared. During the second half of the 20th century, the foremost bayan players succeeded in forcing their way to the academic musical scene. This was conditioned not only by the growth of their mastery, but also by the leading composers' increasing interest in bayan. Virtually all the authors whose works are included into the present volume are major figures of our chamber instrumental music, and some of them enjoy a worldwide renown. Nagayev Aleksandr Petrovich (b. 1947) — composer. In 1980 he graduated from the composition class of N. I. Peiko at the Gnesins State Institute for Musical Education. Author of vocal and instrumental works, including a number of compositions for bayan (Sonata in memory of VI. Zolotaryov, two Children's Suites, Poem for bayan, string orchestra and percussion, etc.). Londonov Petr Petrovich (1928—1981) — composer. Graduated from the composition class of E. I. Messner at the Moscow Conservatoire. Honoured Art Worker of the RSFSR (1978). Member of the Union of Composers of the USSR (since 1971). Author of works for Russian folk instruments, chorus, piano. He wrote a number of works for bayan, including a concerto with orchestra of Russian folk instruments, a sonata, arrangements of folk songs and dances. Volkov Kirill Evgenievich (b. 1943) — composer, teacher. In 1967 he graduated from the composition class of A. I. Khachaturian at the Moscow Conservatoire, in 1969 completed his post-graduate. studies under the guidance of Khachaturian. Member of the Union of Composers of the USSR (since 1969). Head of the composition chair at the Gnesins Academy of Music, Professor, Honoured Art Worker of the RSFSR (1984). Author of the opera 'Live and Remember' after V. Rasputin, as well as of numerous works for chorus, symphony orchestra, orchestra of Russian folk instruments. His bayan works include the Sinfonietta for two bayans and symphonic orchestra, the Concerto for bayan and chamber orchestra, three sonatas, 'Canticle of Ivan the Terrible' for cello and bayan. Zhurbin Aleksandr Borisovich (b. 1945) — composer. In 1969 he graduated from the composition class of Professor N. I. Peiko at the Gnesins State Institute for Musical Education; in 1973 he completed his post-graduate studies at the Leningrad Conservatoire under the guidance of Yu. G. Kon. Member of the Union of Composers of the USSR (since 1970). Honoured Art Worker of the Russian Federation (2003). Author of several operas, including the first Russian rock-opera 'Orpheus and Euridice', as well as of symphonic, chamber instrumental, vocal works and pop songs. His bayan works include three sonatas, the Concert Diptych, Fantasy and Fugue, Toccata, Suite, etc. Banshchikov Gennady Ivanovich (b. 1943) — composer, teacher. In 1966 he graduated from the composition class of B. A. Arapov at the Leningrad Conservatoire and in 1969 he completed his postgraduate studies under Arapov's guidance. Member of the Union of Composers of the USSR (since 1967). Author of operas, symphonic and chamber works, including four sonatas for bayan. Gubaidulina Sofiya Asgatovna (b. 1931) is one of the most prominent composers of our time. In 1954 she graduated from the piano class of G. M. Kogan at the Kazan' Conservatoire, then she studied composition with N. I. Peiko at the Moscow Conservatoire (graduated in 1959), and in 1963 she completed her post-graduate studies there under the guidance of V. Ya. Shebalin. Member of the Union of Composers of the USSR (since 1961). Honoured Art Worker of the Russian Federation (1990). Author of symphonic, chamber, choral works. Her music for bayan includes 'De profundis', the sonata 'Et exspecto', 'Seven Words' for bayan, cello and string orchestra, 'Silenzio' for bayan, violin and cello, the concerto for bayan and symphonic orchestra 'Under the Sign of Scorpion'. Derbenko Yevgeny Petrovich (b. 1949) — composer, teacher. Graduated from the bayan class of A. N. Gus' at the Gnesins State Institute for Musical Education, studied composition as an optional subject with Yu. N. Shishakov. Member of the Union of Composers of the USSR (since 1986). Honoured Art Worker of the Russian Federation (1990). Author of works for chorus, orchestra of Russian folk instruments and separate folk instruments. Berinsky Sergei Samuilovich (1946—1998) — composer. In 1975 he graduated from the composition class of A. G. Chugayev at the Gnesins State Institute for Musical Education. Honoured Art Worker of the Russian Federation (1996). Member of the Union of Composers of the USSR (since 1979). Author of four symphonies, concertos for various instruments, Requiem, chamber instrumental and vocal works. His bayan works include Symphony No. 3 'And the Heaven Disappeared' for bayan and symphonic orchestra, 'II dolce dolore' for cello and bayan, 'Seascape' for violin and bayan. Semyonov Vyacheslav Anatolievich (b. 1946)— teacher, performer, composer. In 1969 he graduated from the bayan class of A. A. Surkov at the Gnesins State Institute for Musical Education; in 1974 he completed his post-graduate training under the guidance of O. M. Agarkov. In 1979—82 he studied composition with A. I. Kusyakov at the Rostov Institute for Musical Education. People's Artist of Russia (1995). Professor of the Gnesins Academy of Music (since 1988). Author of numerous works for bayan, including Sonatas Nos. 1 and 2 ('Baskariada'), 'Brahmsiana', Fantasy on Ya. Frenkel's song 'Kalina krasnaya' ('Red Guelder Rose'), etc. Denisov Edison Vasilievich (1929—1996) — an outstanding Russian composer. In 1950 he graduated from the piano class at the Tomsk music college, while in 1951 — from the faculty of mechanics and mathematics at the Tomsk University. In 1956 he completed his studies at the Moscow Conservatoire where his teachers were V. S. Belov (piano) and V. Ya. Shebalin (composition). Author of operas, ballets, symphonic, instrumental and vocal works, numerous concertos. In 1987 he wrote a piece entitled 'The Steamboat Passes the Harbour' — a fantasy on Soviet songs of '30s for bayan, piano and percussion. Ledenyov Roman Semyonovich (b. 1930) — an outstanding Russian composer. In 1955 he graduated from the composition class of A. A. Aleksandrov at the Moscow Conservatoire; in 1958 he completed his post-graduate studies under Aleksandrov's guidance (he studied also with N. P. Rakov). Author of oratorios, cantatas, symphonic and choral works, concertos. The piece '...against a background of Russian landscape' published in the present volume is his first work for bayan. Ryabov Vladimir Vladimirovich (b. 1950) — composer. Studied composition with A. I. Khachaturian at the Moscow Conservatoire; in 1977 graduated from his composition class at the Gnesins State Institute for Musical Education. In 1979 completed his post-graduate studies at the Leningrad Conservatoire under the guidance of B. A. Arapov. Member of the Union of Composers of the USSR (since 1978). Honoured Art Worker of the Russian Federation (1995). Author of symphonic, choral, chamber and piano works. The piece published in the present volume is his first work for bayan. Podgaits Efrem Iosifovich (b. 1949) — composer. In 1974 he graduated from the composition classes of Yu. M. Butsko and N. N. Sidel'nikov at the Moscow Conservatoire. Honoured Art Worker of Russia (2000). Member of the Union of Composers of the USSR (since 1978). Author of three symphonies, seven operas, a ballet, 18 concertos, choral works. His bayan works include a concerto with chamber orchestra, 'LIPS-Concerto' with symphonic orchestra, 'Ex anima' with string quartet, a sonata, etc. Kholminov Aleksandr Nikolaevich (b. 1925) — an outstanding Russian composer. In 1950 he graduated from the composition class of E. K. Golubev at the Moscow Conservatoire. Member of the Union of Composers of the USSR (since 1950). Winner of State Prizes of the RSFSR (1969) and the USSR (1978). People's Artist of the USSR (1985). Author of numerous operas ('Optimistic Tragedy', 'Chapaev', 'The Overcoat', 'The Carriage', etc. ), vocal-orchestral works, works for orchestra of Russian folk instruments. His famous Suite for bayan (1951) ranks among the masterpieces of the bayan repertoire. His Concertante Symphony for bayan (1999) crowns the 10th part of this Bayan Anthology.